Fiber Antics by Veronica: Mitts are a Hit! Even though the weather has been in the 90s this week, my knitting students braved the heat (in the air conditioned classroom) to work on their fingerless mitts project in my Knitting II class. Here are their completed projects. In the Fingerless Mitts class, students learn how to make cables, a gusset, work with the mattress stitch for an invisible seam and a few other things. The fingerless mitts are a fun, quick project and we discuss in the class how they can be customized with a variety of knitting and embellishing details. 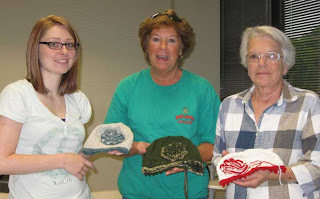 My Knitting in the Round class ended last week. Students embellished their Retro Cloche with a 2-color knitted rosette. There are lots of great techniques to learn with this project as well. But, as one student voiced her preference for knitting in the round, there are no seams to finish when you knit in the round!